With an ageing population and greater health needs such as chronic disease and complex care, Sydney North Health Network has welcomed the decision by the Government to hand the Aged Care portfolio to The Hon. Minister for Health Sussan Ley. In the next twenty years, the population of people aged 65 years and over is expected to grow to 4.5 million. Lynelle Hales, CEO at Sydney North Health Network, said bringing the aged care and health portfolios together under the one Minister will help to achieve greater integration of services and improve healthcare delivery to our aging community.. Supporting Minister Sussan Ley in the Health Portfolio is the first Indigenous Minister to be sworn in to the front bench – The Hon. 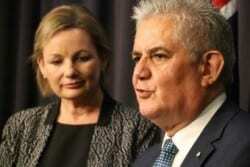 Ken Wyatt – who will act as Assistant Minister for Health. Before entering politics, Mr Wyatt worked in community health, including as director for Aboriginal health in WA and NSW. The health team is rounded out with Minister for Rural Health, Fiona Nash – who was previously the Assistant Health Minister.